Footprints in the Butter: Summer of Service A.C.T.S. : Imagine! A month ago, I posted my first Summer of Service A.C.T.S. 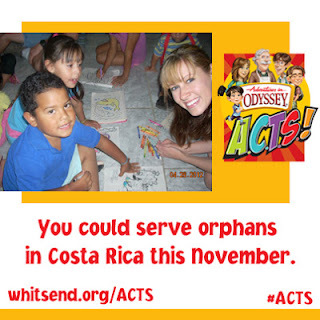 blog post, where I talked about the Adventures in Odyssey initiative to Discover the joys of serving others this summer. This post is about imagination, and imagining ways of serving. Your kids have a chance to put together a video about how they are serving, for a chance to go serve orphans in Costa Rica. That is a trip we're having fun imagining ourselves on! I have the chance to give away books 1-3 of The Imagination Station series. I love these books (in fact, I'll be reviewing #11, Hunt for the Devil's Dragon, later this week), especially for struggling or reluctant readers. You can check my review of Attack at the Arena, one of the three titles you can win. This is so cool. One thing we are doing this summer is Going to a nursing home. My little ones have really enjoyed visiting with the residents and it has been a really nice experience. We've gone to the nursing home with our American Heritage Group and my children want to volunteer at the AWL and my 8 year old wants to start saving for a foreign mission trip. We planted flowers and too them to neighbors who couldn't get out much to brighten their day! Helping to cook and clear the table when company comes over! Right now my oldest daughter is serving by being a junior counselor for a week of church camp. She's actually in charge of the pre-campers (children of staff/teachers), and I hear she's doing a fabulous job. My kids love to bake goodies for people in our church.